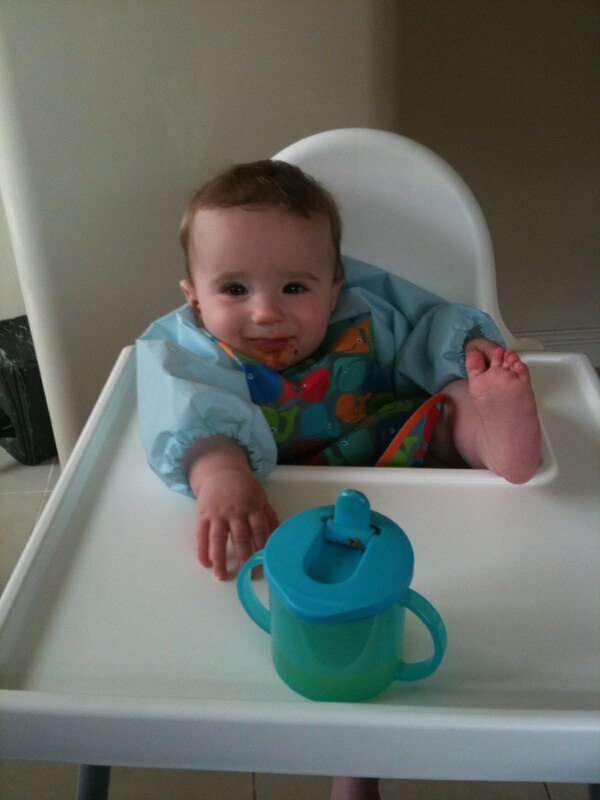 After Baby W stared hungrily on at mealtimes from just 4 months old we began weaning fairly early on. By 6 months he was ready for finger food and he just loves feeding himself. At this stage we found his Bumbo seat with attachable tray ideal. I could plonk a home made rusk in front of him and he was happy playing with this for a good half hour, enabling me to get stuck into the washing up. Also really handy when visiting the grandfolks. Once he got a fair bit bigger, and much much stronger a problem arose. He learnt how to detach the tray himself and said tray, plus whatever foodie contents, would be sent flying across the kitchen while he giggled on with glee. Time for a highchair me-thinks. Having no idea where to start with the huge amount available I did a quick poll of my Facebook Mummy friends. As ever, they came up trumps with 2 clear winners. The Stokke Tripp Trapp and a white plastic one from IKEA. Both clearly loved by their owners but at opposite ends of the budget scale! The Tripp Trapp will set you back in the region of 150 GBP and the cushions an extra 25 GBP. Having said this it really is a beautiful bit of furniture which will grow with your child until they reach 5 or 6. It does not, however, have a tray, requiring your child to be fed at the dining table and, given Baby Ws current penchant for food-flinging I really want to keep mealtimes to the kitchen where at least the floor can be wiped clean! Pity same can’t be said for the walls. ‘The plastic one’, as it appears to be commonly known, or the Antilop to give it it’s proper name, with detachable tray, will set you back a mere 15.29 GBP . It is available in red, white or blue and consists of a plastic seat with safety belt and silver metal legs. It is extremely lightweight, completely wipe-clean, HUGE plus for me, and very easy to store as you can simply pull the legs off. Mr B and I decided to give this a whirl figuring that if it didn’t work out we have only lost 15 quid…..and Baby W LOVES it. I wasn’t really sure why the safety belt was required until this happened…. ….He was either trying to look extremely cool or was making a break for freedom. Given he knew he was about to be fed more home-made bolognese I fear the latter. We now use the belt. I think this is probably one of the best value baby products I have come across so far and love having W in the kitchen with me more. A little of me still yearns for the beautiful smooth lines of the Tripp Trapp though and perhaps when W is a bit older, eating meals with us more and perhaps getting more of his food actually into his mouth, we may dig a bit deeper and invest in one. Best bit: Wipe clean! Excellent for my ever increasing OCD. « Belly-busting countdown…36 days left.